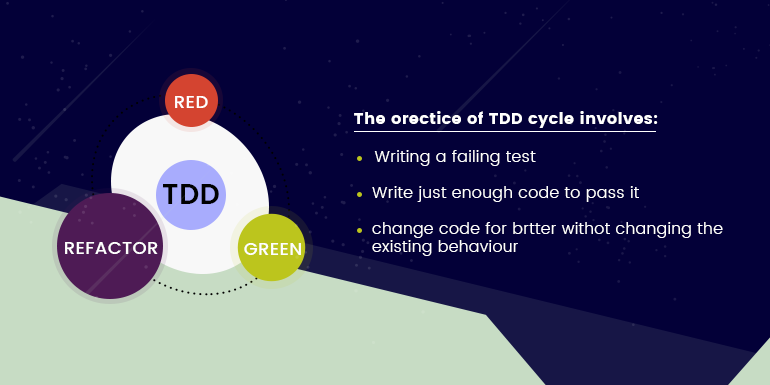 Home > Blog > What is TDD (Test Driven Development) ? Test-Driven Development starts with designing and developing tests for every small functionality of an application. In TDD approach, first the test is developed which specifies and validates what the code will do. TDD is neither about “Testing” nor about “Design”. TDD does not mean “write some of the tests, then build a system that passes the tests. In the traditional development approach first, you select a user story, then develop it, run tests over it and refactor the code until the test is passed. In this method, the coding is done before testing. The disadvantage of using this approach is that you are unable to discover the errors or missing cases until the functionality has been fully developed. With TDD, you write tests upfront for functions that doesn’t yet exist. You know that the test will certainly fail at the start, but minimal incremental coding at each stage will make sure it will eventually pass at some point. So, this process makes sure you won’t miss any scenarios once the functionality is fully finished. With TDD, tests are created for each bug. These tests will be run each time there is another bug fix. This is to make sure bugs don’t reoccur in the code. Because tests are in place upfront, regression testing time can be reduced considerably. Writing tests, followed by minimum code changes after each test run will make sure there is good unit test coverage for the software, which will again contribute to the overall quality of the product.